I just had to share this awesome recipe from my friend Tiffanie over at Focus on the Coast! Tiffanie is an author, Military wife, mother and all around great lady. I hope you enjoy her recipe and be sure to check out her articles over on Focus on the Coast and her memoire “Dwarf” about her rare genetic disorder called diastrophic dysplasia. As a kid, I spent many holidays separated from family while my mom served in our United States Air Force. Our duty station uprooted us from Boston and placed us miles away in San Antonio, Texas. It was hotter there in the fall than it was in my hometown; so hot apple cider for Halloween didn’t really bode well with the outdoor temps. Today, I play a similar role for my son, Titan. While dad is away it’s my job to make each holiday enjoyable, memorable, and fun. And wouldn’t you know it, the North Carolina warmth isn’t exactly gone come Halloween, either. So, this weekend, for my son’s first spook-tacular party I’m drawing from my mom’s old theory: a sweet milkshake treat in the belly is the right way to welcome the goblins and ghouls in your neighborhood. 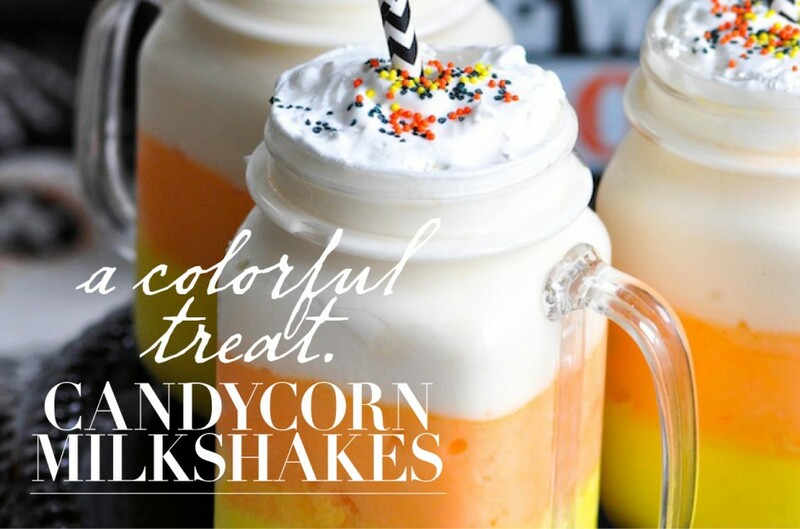 With help from Shauna Adkins, another military momma accustomed to the joys and trials of military life, here is our recipe for Mango Orange Candy Corn Milkshakes that’s all natural and unlike many renditions that call for heavy doses of food coloring, because if you’re a mom like me, you’re weary of the copper levels present in many popular brands. Titan and I will still miss dad. And we’ll still hope next year he can go trick-or-treating with us. But, perhaps most of all, we’ll look forward to making him this sweet milkshake treat when he gets home. Start with the Mango Ice Cream. Fill each mason jar approximately 1/3 of the way. Pat it down gently and wipe off any excess ice cream that may have streaked the inside of the jars. Next, place your jar in the freezer for 15 minutes or so. Note: If you place your jar on the top shelf in the back of your freezer it makes for a quicker freeze time. When your 15 minutes is up, take a look at the center of your first layer. Is it jiggling a bit? If so, you may need to pop it back in for a few more minutes. If not, then you’re ready for the next layer—Orange Sherbet. Scoop out the sherbet and fill each jar again approximately 1/3 of the way. Wipe down any excess. And stick back in the freezer for another 15 minutes. You may be wondering: Why am I not adding any milk to this milkshake or blending? The answer is because the sherbet’s consistency takes the place of adding milk. If milk were to be added, freezing each individual layer would become extremely problematic and the colors would displace. After the layer of sherbet is solid, add the Vanilla Bean ice cream. The black flecks present in Vanilla Bean add an additional festive touch! Smooth the top and make sure to leave enough room for the kiddos to place whip cream. Finally, add sprinkles and insert straws (if your family is like mine, they’ll want to dig in with a spoon) and enjoy! ❮ ❮ Win a pair of Gurus Natural Rubber Sandals!